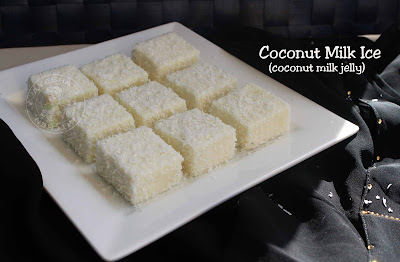 Coconut milk recipes are always my all time favorite. Especially coconut milk dessert recipes are mouth-watering delicious. Jelly recipes are kids favorite and I thought of sharing an easy jelly recipe with agar agar or china grass and coconut milk. Gelatin is the main ingredient which is used in the preparation of jelly. But I always prefer chinagrass instead of gelatin as chinagrass is purely vegetarian. The rich taste of coconut milk and condensed milk along with the agar agar which acts as a jellying agent, makes this dessert very special. The desiccated coconut used to coat the jelly is the other attraction of this yummy dessert recipe. 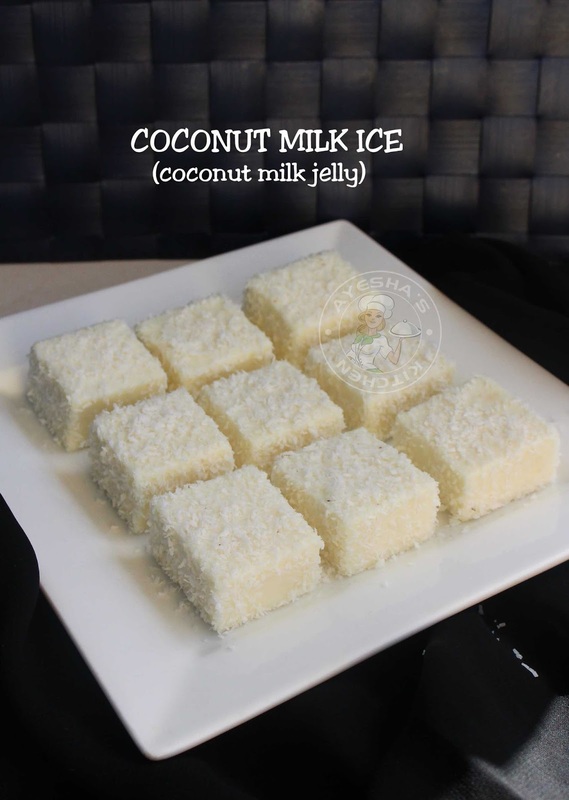 So let us see how to make coconut milk jelly/ chinagrass pudding/ agar agar pudding/ coconut milk pudding/ yummy pudding recipes/ easy pudding recipes/ jelly recipes. In a pan, add china grass / agar agar along with a half a cup of warm water. Combine well and switch on the flame. Let it cook over a medium flame until it melts completely into a clear liquid. Stir continuously. When done, set aside in a bowl. (be careful that it will set quickly once it is cooled, so stir occasionally until we prepare the milk mixture). Boil milk and coconut milk in a pan. Stir occasionally. When it boils, add the sweetened condensed milk and mix very well. Add a pinch of salt to balance the taste and sugar if required for more sweetness. Combine well and add the prepared agar agar mixture, mixing continuously until the agar agar mixture is well combined. When done, remove from flame and pass this mixture through a strainer to avoid any lumps. Now you can transfer it to a square tray or any silicon molds and keep refrigerated once it is cooled. Let it stay in the refrigerator for 6 hours or overnight. Slice it into desired shapes or can use a cookie cutter. Coat it with desiccated coconut and serve. Soups are hearty comfort food which can be prepared with less mess. 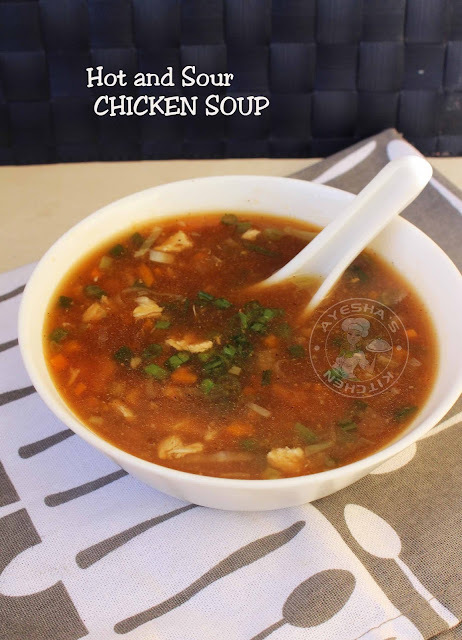 I often make Clear chicken soup recipe at home using fresh chicken stock. For me, chicken soup is my favorite but my daughter loves sweet corn soup the most. So I used to add veggies to my chicken soup like carrots chopped, cabbage chopped, sweet corns like so. 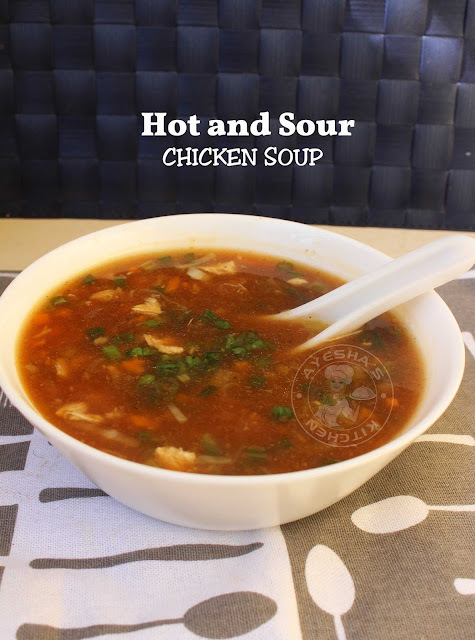 Today am going to share the recipe of Hot and sour chicken soup. As the name implies, this soup is little spicy hot. I used fresh chicken stock instead of store bought in this soup recipe. 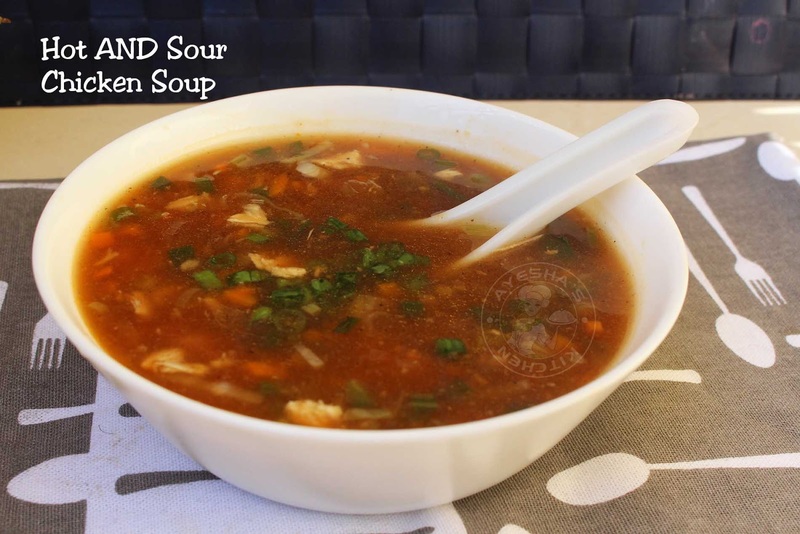 For hot and sour soup, the sauces are the main attraction. So instead of adding each sauce separately, mix everything in a bowl and then add it to the soup for the perfect flavor. So let us see how to make Hot and sour chicken soup at home. Put the chicken breast in a pan along with bay leaf and two cups of water. Let it cook until chicken becomes tender. When done, take out the chicken breast and set aside the water discarding the bay leaf. Chop the cooked chicken breast into small cubes. Set aside in another bowl. Now mix together all the ingredients given under 'for the sauce' and set aside. Now heat a wok with butter. Saute the chopped spring onion white part, chopped garlic, and chopped green chilies. saute for a minute and then add carrot chopped and cabbage chopped. After a minute, add the chicken cubes and give a fine mix. Add stock water and let it cook for 5 minutes. To this, add pepper powder and salt. Add the prepared sauce mixture and mix well. Finally, add the cornflour slurry and let it cook for 2 minutes, stirring continuously. Garnish with chopped spring onion. Serve piping hot and enjoy. Please SUBSCRIBE AYESHAS KITCHEN for more yummy videos. Thank u. Do not ever skip your breakfast meal even on those lazy or busy days. 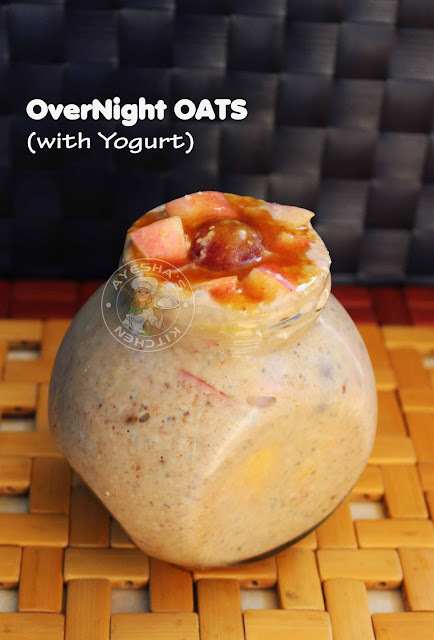 Instead, go for this simple yet healthy breakfast oats. Sometimes, we will sacrifice our health for the sake of convenience by heating up frozen meals. We don't want to waste our valuable time in the kitchen, making breakfast. Like so, we all know that shedding weight by cutting down the breakfast is not at all good for health. Still many of us are very careless about our breakfast. So for those who want to whip up their breakfast meal within minutes without sacrifice on taste, here is my healthy weight loss recipe that will be ready in no time and help you to shed weight. You can check my blog for many other weight loss recipes and overnight oats recipes. Here i used chia seeds, cocoa powder, and greek yogurt for this no cooking oats recipe. Do you know the health benefits of cocoa powder? It is not just a great way to satisfy your sweet tooth but it is also a way to shed weight when used in moderation. So let us see how to make overnight oats with yogurt and cocoa powder. In a jar (i took a big one which serves two) add quaker oats along with a cup of low-fat milk or Almond milk and yogurt. Combine well with a spoon. To this, add chia seeds and again mix well to combine. Keep it in the refrigerator for at least 5 hours or preferably overnight. To this, add cocoa powder and dates puree (soak 5 dates in warm water and squeeze it well with hands and pass it through a strainer to get the puree). Again mix well. 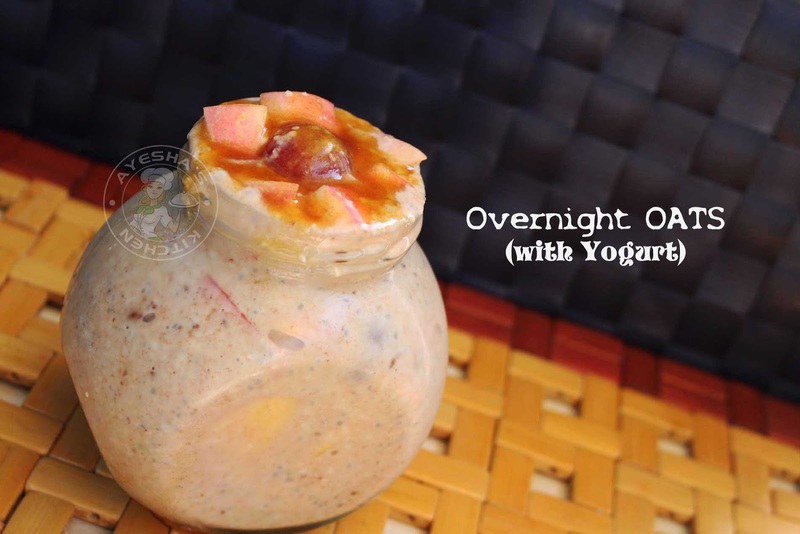 Here dates puree is used for the sweetness and so use accordingly. SERVE - Now take two serving bowls, add some chopped apple and grapes, pour this oats mixture, and drizzle some dates puree and serve. Yummy overnight oats ready. 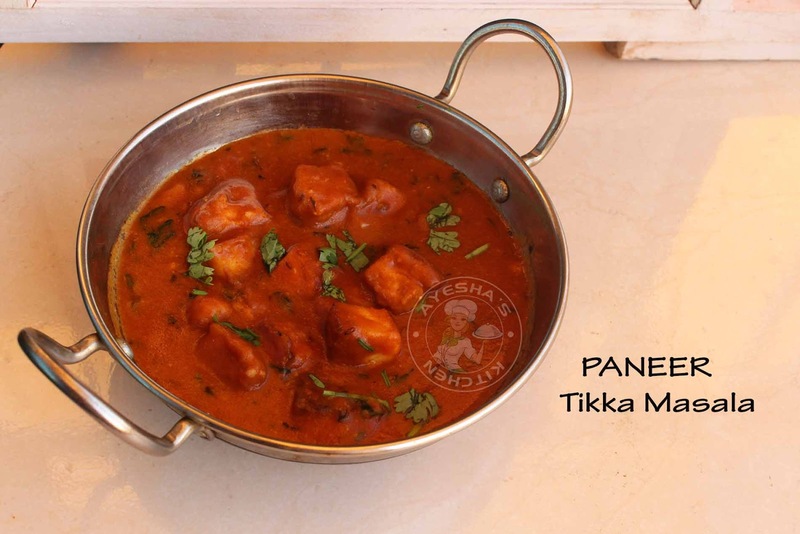 Paneer tikka masala is a very popular veg side dish recipe and can be prepared in different ways. It is usually served along with butter nan, chapati, paratha like so. 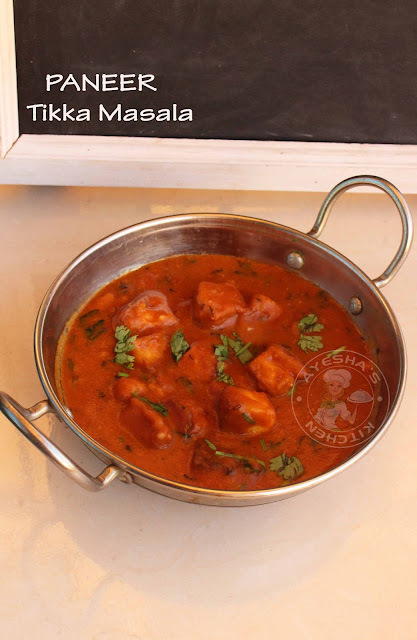 I have shared a paneer tikka masala on my blog a few months back. That recipe calls for onion but here am sharing yet another variation in paneer tikka masala without onion. For this recipe, i used Homemade paneer which is very simple to make at home. All you need for making Paneer at home is Milk and lemon juice. Cooking is my passion and i love to cook for my family, friends, and relatives. Nourishing the heart and soul of people through yummy food is something great for a passionate cook like me. Restaurant style paneer tikka masala is very much liked by most of us. Though am not a paneer recipe lover, i love to have this restaurant style paneer tikka masala. 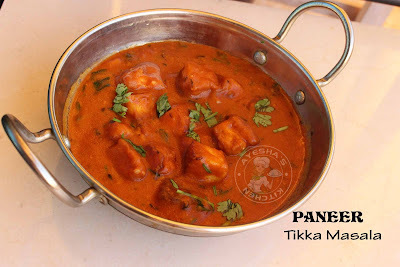 So let us see how to make paneer tikka masala recipe without onion. Marinate the paneer with gram flour, curd, coriander powder, turmeric powder, chili powder, and salt. Keep refrigerated for 30 minutes (very important). Now heat oil in a pan for shallow frying. Fry the paneer until both sides turn slightly golden. Transfer it to a plate. Set aside. Heat a wok with 2 tbsp of oil. Splutter cumin seeds. When done, make the flame to very low. Now add hing, coriander powder, turmeric powder. Saute well for a minute. Then add kasuri methi and ginger paste. Saute until the raw smell disappears. Now make the flame to medium and add the tomato paste along with chilli powder. Combine very well and cook until oil floats on the top. Then add the cornflour mixed water and combine well. Add sugar, garam masala powder and check for salt. Now add chopped coriander leaves and mix well. Add the fried paneer now. Let it cook for 4 minutes. Finally, add a tbsp of fresh cream (or can use 2 tbsp of butter.). Cook for a minute and serve hot. 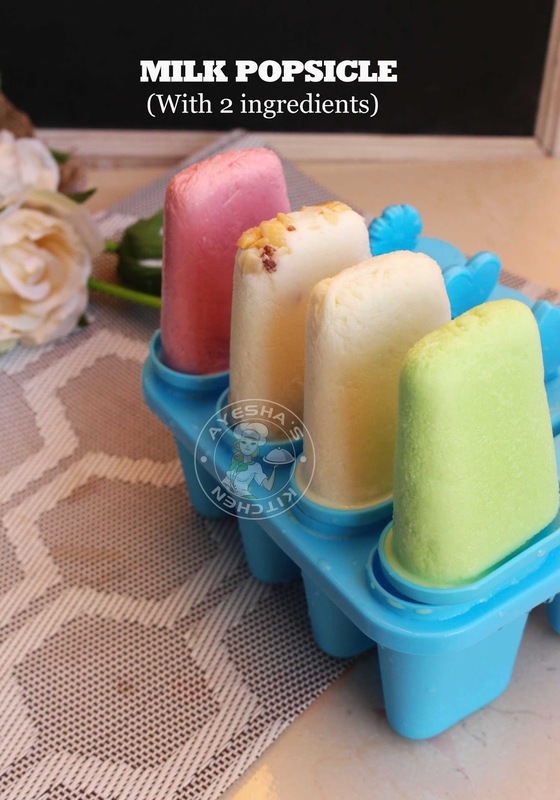 Milk popsicle recipe or popularly known as Paal ice is a nostalgic popsicle with very few ingredients. In my school days, Summer holidays are incomplete without milk popsicle (paal ice) and sip ups. Today while am making this milk popsicle, my mind reminds me of those school days with my friends and cousins. I really miss each and every moment we spent together and those days we are living for today and there were no tomorrows. But today everything changed and we are living for tomorrow's only. Lil bit Nostalgic feel .right? Ok. Let's move on to the recipe. 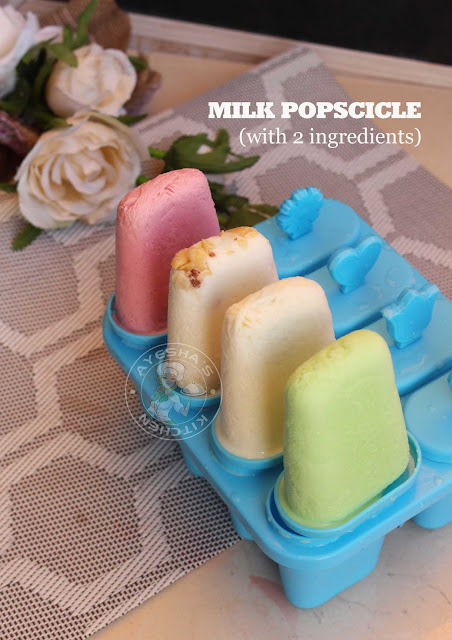 Here am going to share the recipe for Milk popsicle with just two ingredients. Full cream milk and sweetened condensed milk are the two ingredients required for making this simple and quick popsicle recipe. Vanilla essence, rose milk essence, pista essence is the other ingredients which add color and flavor to this popsicle. Milk popsicle with nuts is really awesome. You can also add a few drops of chocolate sauce to this milk mixture for chocolate milk popsicle recipe. 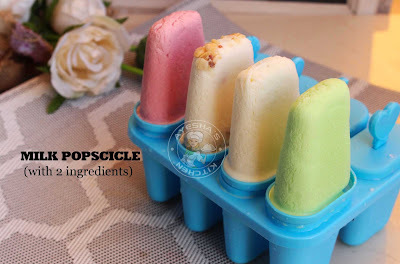 So hope you all give this popsicle recipe a try and drop your valuable feedback in the comment box below. Dry the popsicle mold well and set aside ready. Boil the milk (full cream) and cool it. Set aside ready. Now let us make the milk mixture - In a bowl, add the boiled and cooled milk. To this, add the sweetened condensed milk. Mix very well until well combined. Now add vanilla essence. This gives a fine flavor or u can skip this and pour this milk mixture into the popsicle mold. Here am showing four flavors of milk popsicle in a single recipe. Pour two popsicle molds with this plain milk mixture. Other two popsicle molds with nuts and milk mixture. Mix pista essence with some milk mixture in a cup and pour into the popsicle mold. Mix rose milk essence with some milk mixture in a cup and pour into the popsicle mold. Let it freeze for 8 hours. When done, take out the mold. Keep it outside down and show it under tap water for 10 seconds (do not keep it more as it will melt). Then gently open it and enjoy. It is very hard to take a perfect picture of a popsicle as it melts within minutes. (so please excuse me for the same). 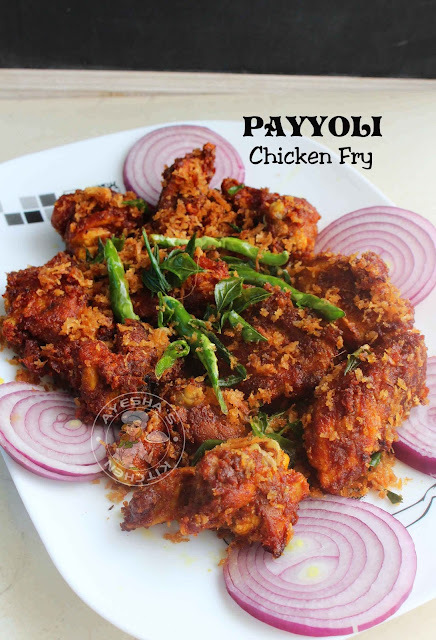 Chicken fry recipe is the simplest chicken recipe which can be made in different ways and styles. The chicken dish which we always prefer to cook at home on those lazy days. 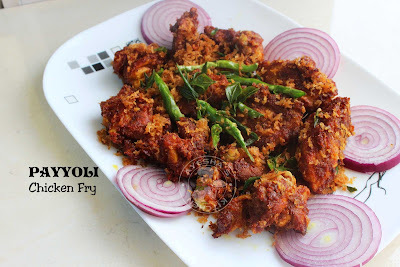 I have shared many chicken fry recipes on my blog such as Spicy chicken fry, Thattukada chicken fry, Pepper chicken fry like so. This chicken fry recipe is a Kerala style chicken fry with Kerala spices. Payyoli chicken fry is a Malabar special chicken fry recipe which is very flavorful. This dry chicken dish is very popular among Keralites, especially among Malabaris. Payyoli is a place in Kozhikode district which is situated in the South Indian state of Kerala. Payyoli is also famous in the name of PT Usha, as it is the hometown of This Athlete. 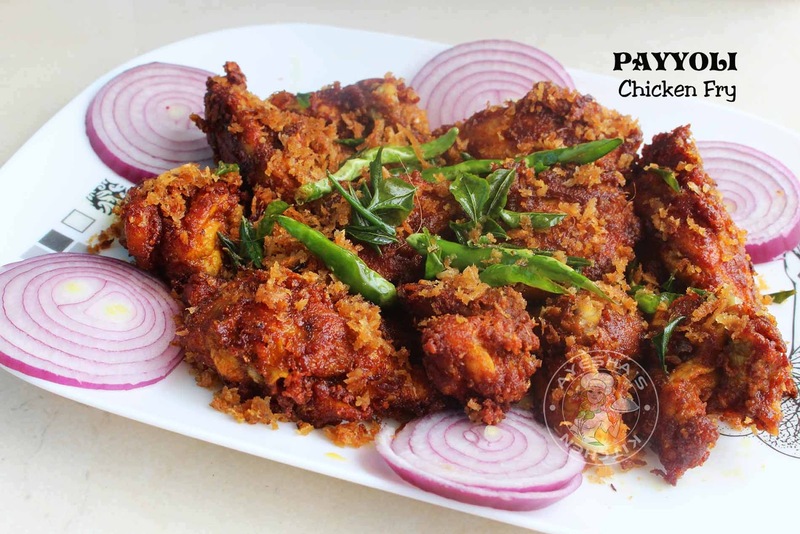 This chicken fry is very popular in Payyoli. Now this recipe has become our family favorite too. Chicken pieces are well marinated in the spicy chicken marinade and then fried in coconut oil until crispy. Later it is served along with crispy fried scraped coconut, curry leaves and green chilies which makes this chicken fry recipe more special. Make a chicken marinade with chili powder, turmeric powder, coriander powder, meat masala powder, ginger garlic paste, vinegar, and salt. Marinate the chicken pieces in this marinade and keep refrigerated for 15 minutes (not more than that). After 15 minutes, add cornflour (just before you are going to fry the chicken). Combine well. Once hot, make the flame to medium. Then fry the green chilies and curry leaves. Transfer it to a bowl. Then fry scraped coconut. Fry until slightly golden (be careful while frying coconut, it will burn quickly). Transfer it a bowl. Set aside. Now slide the marinated chicken pieces one by one to the hot oil. Do not fry overcrowded. Flip only when one side is done. Fry until both sides turn golden and crisp. When done, transfer it to a plate. Now combine chicken fry with the fried coconut, curry leaves, and green chilies. Serve hot. Please subscribe to my channel Ayeshas kitchen for more quick video recipes.